Bernard Casey was born in Eagle Rock, Wisconsin, on November 25, 1870, the sixth of sixteen children. Although he felt a calling to the priesthood early in his life, due to the economic conditions of his family, he left these ideas in abeyance. Thus, he worked in brickyards, in hospitals, as a logger on the river, a streetcar motorman and even as a prison guard in the state penitentiary of Minnesota. Despite a short romantic interlude during which he even proposed to the girl of his dreams, he eventually followed the call he felt in his youth. At the age of twenty-one, he began his training for the priesthood by beginning high school. Once he had completed this and after some trouble, he eventually entered the German speaking Capuchins of Milwaukee, © Solanus Casey Guild of Detroit, MI. Since he did not speak German, this was an added burden to his limited intellectual abilities. With classes taught in German and texts in Latin, Father Francis Solanus did not excel in his studies, but he was noted for high spirituality, a burning love for God and deep humility. Because of his lack of knowledge, he was ordained as sacerdotus simplex. After a series of assignments in friaries in New York City, in 1924, twenty years after his ordination, he was transferred to St Bonaventure Friary in Detroit. Here the story of his saintly life unfolded. His great love of the Mass and of the Missions urged Fr. Solanus to work constantly for the Seraphic Mass Association. This apostolate had startling results and responses from the people whom Fr. Solanus enrolled. Many cures were reported. He was a man of extraordinary child like faith, which grew in glorious intensity through the years. Fr. 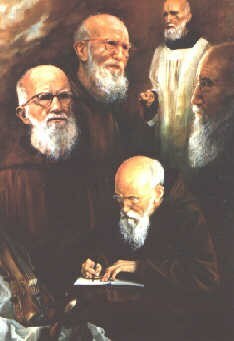 Solanus' influence spread all over the United States and he was known by many in Canada. Hundreds attributed to his intercession, seemingly inexplicable, spiritual reformations, and physical cures, but it was his boundless charity and luminous goodness and faith, that won countless hearts to Christ. After 53 years as a priest, the Almighty saw fit to call Fr. Solanus to his rest. He died a very sick man, covered with eczema, yet his most common words in this time were "Thanks be to God." Thus, he died a true son of St. Francis on the 31st of July, 1957.